As India heads for the general election in May 2019, 2017–2018 marked a major push for reforms and policies by the government headed by the Bharatiya Janata Party. The Goods and Services Tax (GST), the long-pending reform that sought to unify indirect taxation in India was launched on 1 July 2017. The government also rolled out the Indian Bankruptcy Code to provide a resolution framework that will help corporates clean up stressed assets and reduce debt. Asset classes in the Indian real estate sector include standalone commercial (comprising business parks, special economic zones, hotels, hospitality, shopping centres, etc. ), residential assets or a combination of both in a mixed-use project. Developers have also in the recent past focused on the development of full-fledged townships that cater to a wide variety of investors and customers. Assets in the Indian real estate market are mostly aggregated at the local level. Development entities either buy from these aggregators or enter into development arrangements with land owners. Large project requirements are also met through government-assisted acquisitions. Land is usually held through multiple special purpose vehicles (SPVs) holding real estate assets. Multilevel holding structures are typically used for reasons of consolidation, corporatisation, ease of unbundling, ring-fencing project-specific risks, itemised scalability and future potential to list holding companies for fundraising. Typically, investments are held though corporate entities and SPVs, and in businesses without a foreign investment element, through partnership firms and limited liability partnerships driven primarily by tax benefits, low compliance, and ease of setting up and winding up. Avenues for fundraising in the real estate sector are fairly skewed as a result of regulatory hurdles and lack of confidence in developers given the manner in which the sector has been operated over the years. Under the domestic banking laws,10 scheduled commercial banks are restricted from lending for acquisitions of land. Further, a promoter’s contribution towards the equity capital of a company needs to be brought in from the promoter’s own resources, and the banks are not permitted to grant advances for the acquisition of shares of other companies. With bank funding for land and the acquisition of SPVs ruled out, construction development finance is essentially the only area for which bank funding is available, which is more often than not the second step in a real estate transaction. Such restrictions, however, do not apply to non-banking financial companies, which have in the recent past emerged as strong pillars for this segment. Raising debt by way of external commercial borrowings is not permitted for real estate activities (other than for specific special economic zone-related activities), the acquisition of land and the acquisition of shares. Thus, this funding mechanism is completely unviable for the real estate sector. From a public markets point of view, the track record of publicly traded real estate companies is less than good. While market hopes are now pinned on the REIT platform as the saviour of the real estate public market space, it is currently still a little too nascent to be a force to reckoned with. An encouraging trend can be seen, however, in the regulator’s supportive stance on interpreting the regulatory framework with a view to making REITs happen. With time and new players, more changes in the law in this regard is expected. The extant foreign exchange regulations, have been amended to permit non-residents to invest in REITs, including by way of a swap of capital instruments held in an SPV (which holds the assets) for REIT units, thereby clearing a significant hurdle in setting up a REIT with non-resident PE investors. However, the swap of non-convertible debt instruments for REIT units still requires approval of the RBI and could therefore continue to be a hurdle in case of investments made through debt instruments. Under the current regulatory framework, at least 80 per cent of the value of a REIT’s assets must be invested in completed rent-generating assets. The remaining 20 per cent is permitted to be invested in properties that are under construction or completed, but not for rent-generating purposes. While the general 80:20 break-up is in line with the intent of providing more liquidity and ensuring minimal risk in the hands of a unitholder, REITs are also intended to be a means of revitalising the cash-strapped market for real estate assets, especially under-construction properties. Practically as well, in the case of large office parks that are not substantially complete, or in the case of SPVs operating multiple office parks with some being under development, the under-construction component may need to be carved out to comply with the existing norms. The process might involve regulatory hurdles and significant transaction restructuring costs. Further, in instances where the manager or sponsor of a REIT is foreign-owned or controlled, the REIT would be deemed to be a foreign-owned and controlled entity, and all downstream investments by the REIT would be required to comply with extant foreign exchange regulations. Given that real estate is a significantly regulated sector, this could restrict the funding and investment options available to the REIT. The REITs regulations permit up to two-layer SPV structures to be held by the REIT. Therefore, the requirement of complying with this requirement in cases where assets are held through multilevel structures involves significant restructuring of existing holdings. While specific types of development-related activities are permitted, generally speaking, FDI is not permitted in real estate business (dealing in immovable property with the intent of earning profits), the construction of farmhouses and trading in transferable development rights. Exceptions to this are investments in construction development projects and the earning of rent or income from projects through the leasing of property (without transfer of the same). The equity investment regime has come a long way since the sector’s liberalisation in 2005. Under the 2005 regime, stringent entry conditions such as a minimum capitalisation (US$10 million for wholly owned subsidiaries and US$5 million for joint ventures) and minimum area requirements (10 hectares for development of serviced housing plots and 50,000 square metres for construction development projects) had made projects below a certain size inaccessible to investors. Exits were available only after the expiry of a lock-in of three years or upon completion of the project, which meant that if a project did not take off for reasons of litigation or lack of consumer interest, the non-resident investor would have to sit out for three years. There was also regulatory ambiguity with FDI being meant only for greenfield projects and not for brownfield or existing under-construction projects. Exits from projects prior to a period of three years (even through a stake sale between non-residents without repatriation) required the approval of the Foreign Investment Promotion Board (FIPB), which was not very forthcoming given the sensitivities around the sector. In a significant overhaul in 2014, the present government eased the minimum area requirements, and minimum capitalisation conditions were made applicable from the commencement of the project; however, subsequent tranches of investment could only be brought in until the expiry of 10 years from the commencement of the project. The three-year lock in was done away with, and exits were made possible on completion of trunk infrastructure (roads, water supply, street lighting, drainage and sewage). While the easing of entry conditions did help, the greenfield–brownfield ambiguity continued and exits remained an issue, specifically for stalled or litigation-affected projects. The only way out for projects with no trunk infrastructure was by approval of the FIPB. Transfers between non-residents during the lock-in period were specifically brought into the approval route. As a positive measure, for the first time, investments in the operation and maintenance of completed projects such as shopping centres and business centres were permitted. Thus, the FDI regime in construction development until November 2015 was marred by exit issues. In November 2015, the government did away with most of the entry conditions for investment into a project. Investment can now be brought in for each phase separately, a dispensation that has significantly aided developers in obtaining phase-wise funding from different investors. Although investments by non-residents continue to be locked in for a period of three years, exits are permitted if trunk infrastructure in a project is completed. Exits are no longer linked to absolute transfer restrictions, but are linked to repatriation of funds outside, which means that non-resident investors are permitted to divest stakes to other non-residents without a repatriation of funds, even during the lock-in period, without the requirement of obtaining any approvals from authorities in India. In addition, special economic zones and hospitals, where these sectoral conditions relating to FDI do not apply, and industrial parks (where there is a different regime of commercial projects), investments are now permitted in completed projects for the operation and maintenance of townships, shopping centres and complexes and business centres, subject to a lock in of three years. Investments under the FDI route have to comply with pricing guidelines, which prescribe a fair market value cap (determined based an on internationally accepted pricing methodology) for exits and restrict non-resident investors from agreeing on assured returns on their investments. With significant liberalisation in the FDI regime, it is expected that deal activity in this sector will continue to increase. In the case of industrial parks, while investments are permitted under the automatic route, 66 per cent of the allocable area in the project is required to be dedicated to industrial activity (a specified set of activities), with the park required to have a minimum of 10 units and no single unit occupying more than 50 per cent of the allocable area. Industrial park investments have to continually undertake compliance analysis and keep only a defined tenant base, which on a practical level is sometimes arduous. The market is seeing a rise in the prominence of investments through listed non-convertible debentures (NCDs) subscribed by foreign portfolio investors (FPIs) and non-banking financial companies. From 2017 to 2018, the corporate bond market has raised about 5,990 billion rupees across 2,706 issues through private placement of NCDs.11 Under the Indian foreign exchange regulations, FPIs registered with SEBI are permitted to invest in listed or unlisted NCDs (subject to minimum residual maturity of one year, end-use restrictions on investment in real estate business, the capital market and the purchase of land, and conditions imposed by under the regulatory laws for such security). This, as an investment route, is separate from the FDI regime, and consequently, sectoral caps and conditions, pricing and restrictions on assured returns as applicable to FDI are not applicable to such investments. Till April 2018, NCDs held by FPIs were required to have a residual maturity of three years, which essentially means that the issuer cannot redeem the NCDs (even through optionality clauses) prior to the expiry of three years. The three-year lock-in, however, is not applicable to the sale of NCDs by FPIs in favour of domestic investors. In April 2018, RBI reviewed the policy to revise the minimum residual maturity period of NCDs held by FPIs, to one year. The issuance of listed privately placed NCDs is governed by the Companies Act 2013, with listing and disclosure requirements being regulated by the SEBI (Issue and Listing of Debt Securities) Regulations 2008 and the SEBI (Listing, Obligations and Disclosure Requirements) 2015. NCDs with less than a one-year maturity are required to comply with the Reserve Bank of India (Issuance of Non-Convertible Debentures) Directions 2010, which prescribe higher compliance requirements regarding credit ratings or the eligibility of the borrower, and a restriction on a redemption or put option for a period of 90 days from the date of issuance. In summary, with traditional debt funding through scheduled commercial banks and external commercial borrowings being in short supply, sentiment for publicly traded real estate companies being weak and REITs still in their infancy, investments (both equity and debt) in the real estate sector continue to be dominated by PE investors. the establishment of fast-track dispute resolution mechanisms and the provision of jurisdiction to consumer courts to hear real estate disputes. The RERDA also provides for the insurance of titles of property, which will benefit both consumers and developers if land titles are later found to be defective. While the RERDA is intended to provide investors with much-required developer accountability and transparency, from the perspective of real estate companies, the regulatory burden and compliance costs have significantly increased, with certain conditions, such as the depositing of 70 per cent of funds, posing practical challenges. Additionally, last year witnessed a clear disparity between states with regards to the implementation, with regions such as Maharashtra setting the benchmark in the industry. The lack of infrastructure and non-notification of RERDA rules by some states have led to delays and loss of revenue to different stakeholders. Traditionally, the real estate sector has been highly regulated for foreign investment. Discouraging speculative activities on land has been a major theme of the regulators. Therefore, foreign debt was highly restrictive and equity also came with conditions related to, inter alia, development milestones and lock-ins. With FDI conditionalities now significantly liberalised, transactions in the construction development space have more or less become automatic in the truest sense of the word. A lot of acquisition activity is now seen in the acquisition of completed assets. Management of commercial assets as a separate business skill has been gaining ground, amply supported by technology and best global practices. India’s FDI policy now specifically recognises foreign equity investment for the purposes of operation and maintenance of completed assets. The country has also seen significant restructuring activity in the sector from the point of view of making real estate spaces more marketable commodities: consolidating assets, segregating marketable assets, restructuring for raising finance, tax structuring, court-based mergers, demergers, conversion of LLPs into companies, restructuring partnership interests to permit investments and capital reduction, inter alia, have been used to achieve this end. For investments in completed assets that are part of larger projects, over and above the ‘undertaking’ test from a taxation standpoint, from an FDI perspective, the asset being hived off should independently qualify as a completed project. Significant structuring continues to be adopted around promoted structures and profit-sharing arrangements to incentivise developers. It is not uncommon in commercial projects to have asset or property management and development management arrangements with affiliates aimed as cash-outs to developers. Indemnity or holdbacks, escrow structures, representations and warranties and tax considerations (typically around capital gains and withholding taxes), inter alia, are sector-agnostic, and would apply to real estate investments and exits as well. Many investors who picked up significant stakes in the 2007–2008 bull run are now in exit mode. Owing to limited fund life and other constitutional concerns, PE funds are reluctant to give standard representations at the time of exit. While warranty insurance is slowly gaining traction in India, it comes with its own problems of high premium costs and wide exclusions (including all information known to investors, taking away from them the traditional knowledge exclusion despite their diligence). Investors are now looking at debt investments to gain an upside for their businesses by structuring returns based on business performance or project-based conditions. Being debt, there is downside protection of the principal. Given the fundamental jurisprudence of debt being an absolute obligation to repay, absorbing downside risks remains tricky. Structures with PE investors investing in nominal equity along with private debt are not uncommon. These structures allow investors to exercise control through affirmative voting rights, obtain a board seat as equity holders and receive assured return on their investments as creditors. This not only helps bridge the gap in a company’s capital structure; it is also commercially viable for investors, as it occupies a place between senior debt and equity in terms of security, returns and influence. There are instances where investments are purely into debt but where veto matters are shaped as negative consent rights, which are standard in the lending arena. NCDs usually earn mid to high yields through various combinations of a cash coupon coupled with a redemption premium, cash flow or profit-linked coupons, market-linked returns obtained through exposure on exchange-traded derivatives, or equity-like components such as warrants or convertibles. The slowdown in the real estate market, lack of funding for land acquisitions, defaulting developers and the downgrading of their ratings have led to the sector being highly leveraged. Consequently, developers are now relying on private debt either as fresh debt or by way of refinancing an existing debt. With a high-risk appetite, PE players have shown interest and invested in the NCDs of such companies. However, owing to the risks involved in such investments, such as delays in the completion of projects, projects under litigation and a general slackening of market demand for real estate, interest rates are substantially higher than those found in other sectors. To insulate themselves from the risk associated with such investments, private debt investors typically collateralise their investment by security cover depending on the developer’s credit rating, and personal and corporate guarantees. The trend in securing a high return and easy exit is evidenced by way of redemption premiums and default interest being charged on the non-completion of predetermined construction milestones. The new concentration limits applied by the RBI have ensured that no single investor (along with its related parties) can invest in more than 50 per cent of an issue and invest more than 20 per cent overall in a corporate. While these change were aimed at streamlining the FPI route, the consequences of this on the real estate sector will be significant as no single corporate will be able to access more than 20 per cent of funds from one FPI. While PE players enjoy the many advantages of investing in debt instruments in India, given that NCDs are traded on a wholesale debt market segment, a large part of deal specifics are to be disclosed to the stock exchanges, where information is publicly available. Further, with new listing norms being applicable across the board, key changes to the structure of the debentures also require the approval of the stock exchanges, making changes to bilateral structures subject to regulatory consent. India has entered into various protocols with the governments of Mauritius,12 Singapore13 and Cyprus14 to revise the double taxation avoidance agreements (DTAAs) it had entered into with these countries to provide for source-based taxation of capital gains arising from an alienation of shares instead of a residence-based taxation with a view to preventing double non-taxation, curb revenue loss and check the menace of black money through an automatic exchange of information. It may be noted that the amended DTAAs grandfather investments made prior to 1 April 2017:15 shares acquired before 1 April 2017 will continue to be taxed based on the principle of residence-based taxation (this is subject to a limitation of benefits clause in the case of the India–Singapore DTAA).16 Furthermore, the India–Singapore and India–Mauritius DTAAs provide for a concessional rate of taxation of capital gains17 at 50 per cent of the applicable tax rate in respect of investments in shares made between April 2017 and 31 March 2019, subject to the fulfilment of conditions in a limitation of benefits clause.18 Investments made after 31 March 2019 will be taxable at the full domestic tax rate as per the principle of source-based taxation. It may be noted that the exemption from capital gains tax under the abovementioned DTAAs would be available even for the preference shares which got converted into equity shares after 1 April 2017 as well, so long as the preference shares were acquired before 1 April 2017. Subsequent to the introduction of the concept of a place of effective management (POEM)19 for the determination of the residential status of the company under the Finance Act, 2015,20 the government issued a final guiding principles for determination of POEM on 24 January 2017.21 In cases where a foreign company establishes its POEM in India, it will be regarded as an Indian tax resident, will be liable to pay taxes in India on its global income and may not be entitled to any DTAA benefits. PE funds should ensure that the POEM is outside India and for this purpose, all major decisions relating to the investment and divestment of Indian securities should be taken outside India, and their fund managers should be located outside India. Furthermore, the provisions of General Anti Avoidance Rules (GAAR) are effective from financial year 2017 to 2018 onwards.22 By virtue of the GAAR, the Indian tax authorities are now empowered to declare any arrangement or transaction to be an impermissible arrangement or transaction if it is of the view that the main purpose of carrying out the said arrangement or transaction is, inter alia, for the purpose of a tax benefit.23 Thus, considering the wide ambit of GAAR, a number of legitimate business transactions could come within its purview unless the taxpayer is able to establish its commercial substance before the Indian tax authorities. The threshold limit for the invocation of GAAR is 30 million rupees. However, the GAAR provisions shall not apply to income from the transfer of investments made before 1 April 2017. Having said this, it may be noted that the GAAR provisions shall apply to any arrangement, irrespective of the date on which it has been entered into, in respect of a tax benefit obtained on or after 1 April 2017. Further, on 27 January 2017, the Central Board of Direct Taxes issued a circular providing various clarifications in a Q&A format with respect to GAAR, including the interplay between the GAAR and the Specific Anti-Avoidance Rules provided in the DTAAs. The Finance Act, 2017 has introduced a couple of provisions that deem the fair market value of shares applicable to determining income from transfers of unquoted shares. As per the provisions,24 the fair market value of unquoted shares shall be substituted as the full value of the consideration when the consideration received or accruing is less than the fair market value in the hands of the transferor. If the shares (quoted or unquoted) are received by the transferee either for no or inadequate consideration, the excess of the fair market value over the consideration paid shall be treated as deemed income in the hands of the transferee. Besides the above, taxation issues in PE transactions are traditionally centred around withholding tax deductions on payments made to non-residents and issues under Section 281 of the Income Tax Act 1961. Withholding tax issues are settled mostly through a combination of tax indemnity, a certificate from a chartered accountant or a certificate from the Indian taxation authorities indicating the tax required to be withheld on the consideration payable to the seller. In terms of Section 281 of the Income Tax Act 1961, any transaction involving the creation of a charge on an asset by way of a sale, for example, while a tax proceeding is pending would be void as against a claim in such tax proceeding. Almost all PE transactions face this issue. Under the Income Tax Act, 1961, REITs are accorded a pass-through status for interest income received by the REITs from an SPV and also for rental income earned by the REITs.25 In other words, interest or rental income distributed by a REIT shall be deemed to be income of the unitholders, and will be chargeable to tax in the hands of the unitholders. However, a REIT is required to withhold tax at appropriate rates,26 whose credit can be claimed by the unitholders against their final tax liability payable on the income earned from the REIT. Where the assets in a REIT are held by an SPV, dividend distribution tax (DDT) of approximately 20 per cent27 would be applicable to distributions made to the REIT, making the structure tax-inefficient. However, no DDT is required to be paid for distributions made by SPVs that are 100 per cent REIT-owned (or co-owned with a minimum mandated holding by the co-owner under law), and such dividend received by the REIT and its unitholders shall not be taxable in the hands of the REIT or its unitholders. While these are welcome steps, given that the exemption is limited to only 100 per cent REIT-owned SPVs, the benefits would not trickle down to joint ventures, which form a significant part of the sector’s assets. 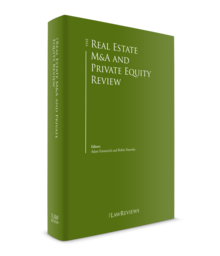 Certain other issues that still require addressing from an industry standpoint include the fact that the tax deferral scheme made available to sponsors on the transfer of SPV shares to a REIT has not been extended to the direct transfer of assets and transfers of interest in LLPs; and that the holding period of REIT units has not been brought on a par with other listed securities at one year for availing of long-term capital gains benefits. The real estate sector is slowly but steadily picking itself up from the lows of 2009 and 2010. Large platform deals are an indication of growing investor confidence. With the government’s impetus regarding infrastructure growth and its continual attempts at economic liberalisation, the road ahead could be said to be smoother, if not rosy. Key areas to look out for in respect of the real estate sector are undoubtedly the REIT platform and the asset class that goes up for trading. While demonetisation caused considerable tumult, it has brought about greater transparency in the real estate sector as the Indian real estate sector comes to grip with RERDA and GST implementation. This would represent a major push to the public market for real estate assets. Clearly, the story of the growth of India’s real estate is far from over. 10 Master Circular – Housing Finance issued by the Reserve Bank of India. 12 Protocol amending the Agreement between the Government of Republic of India and the Government of Republic of Mauritius for the avoidance of double taxation and the prevention of fiscal evasion with respect to taxes on income and capital gains and for the encouragement of mutual trade and investment, signed on 10 May 2016. 13 Third Protocol amending the Agreement between the Government of India and the Government of Republic of Singapore for the avoidance of double taxation and the prevention of fiscal evasion with respect to taxes on income, signed on 30 December 2016. 14 A revised Agreement between the Government of Republic of India and Government of Republic of Cyprus for the Avoidance of Double Taxation and the Prevention of Fiscal Evasion with respect to taxes on income, along with its Protocol, was signed on 18 November 2016. 15 Article 13 of the India–Mauritius DTAA, India–Singapore DTAA and India–Cyprus DTAA. 16 Article 24A of the India–Singapore DTAA. 17 Article 13 of the India–Mauritius DTAA and the India–Singapore DTAA. 18 Article 27A of the India–Mauritius DTAA and Article 24A of the India–Singapore DTAA. 19 POEM means a place where key management and commercial decisions, necessary for the conduct of the business as a whole are, in substance, made. 20 Section 6(3) of the Income tax Act, 1961. 21 Central Board of Direct Taxes Circular 06/2017 dated 24 January 2017. 22 Section 95 of the Income Tax Act, 1961. 23 Section 96 of the Income Tax Act, 1961. 24 Section 50CA and Section 56(2)(x) of the Income Tax Act, 1961. 25 Section 10(23FC) and Section 10(23FCA) of the Income Tax Act, 1961. 26 Section 194LBA of the Income Tax Act, 1961. 27 Includes applicable surcharge and education cess.